One-Time Setup 19,99 € for paying monthly! WebServer now offers even more disk space and working memory. Additionally, in all packages there is a certain number of MySQL databases on SSDs included, which provide massively increased read / write performance. You need more power? Just switch to a bigger package. Your data will be automatically transferred. You will have the same easy to handle process, if you switch from a web hosting package to a WebServer product. Create customer trust and increase a security of your online proposition with the SSL certificate from Host Europe. It is ideal if you want to set up some secure connections for online payment, intranet or extranet applications. 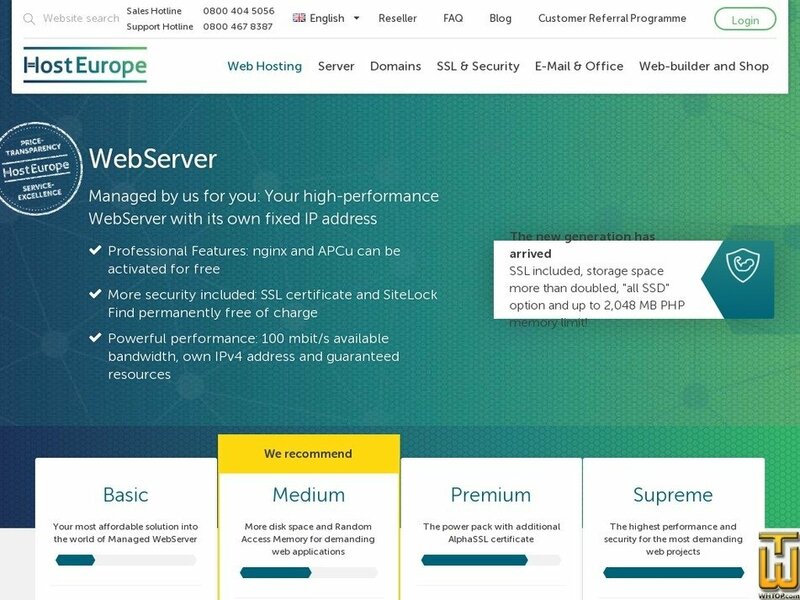 You can enjoy the full performance of your WebServer while we will take care of professional and reliable Managed Hosting Administration. Install and manage a variety of web applications with just one click: blogs, forums and many other web operations can be set up simply and quickly with the Easy Application Installer. There is a daily automatic backup for the security of all your data on the server. You do not need to take care of that. For challenging web operations with your own dedicated IP address. Are you looking for a solution, when you can have dedicated resourses and a professional administration? WebServer Dedicated offers you an ideal entry into the world of dedicated web server with unlimited resources and high security through hardware RAID. We take care of all management, so you can focus on your web project. Price: € 21.99/mo. VAT 20% inc.
Price: € 8.99/mo. VAT 19% inc.